The architecture of India is rooted in its history, culture and religion. Indian architecture progressed with time and assimilated the many influences that came as a result of India's global discourse with other regions of the world throughout its millennia-old past. The architectural methods practiced in India are a result of examination and implementation of its established building traditions and outside cultural interactions. Though old, this Eastern tradition has also incorporated modern values as India became a modern nation state. The economic reforms of 1991 further bolstered the urban architecture of India as the country became more integrated with the world's economy. Traditional Vastu Shastra remains influential in India's architecture during the contemporary era. The Indus Valley Civilization (IVC) was a Bronze Age civilization (2700–1700 BC; mature period 2600–1900 BC) that was located in the northwestern region of the Indian subcontinent, consisting of what is now mainly modern-day Pakistan and northwest India. Flourishing around the Indus River basin, the civilization primarily centred along the Indus and the Punjab region, extending into the Ghaggar-Hakra River valley and the Ganges-Yamuna Doab. Geographically, the civilization was spread over an area of some 1,260,000 square km, making it the largest ancient civilization in the world. The Indus Valley is one of the world's earliest urban civilizations, along with its contemporaries, Mesopotamia and Ancient Egypt. At its peak, the Indus Civilization may have had a population of well over five million. Inhabitants of the ancient Indus river valley developed new techniques in metallurgy and handicraft (carneol products, seal carving) and produced copper, bronze, lead, and tin. The civilization is noted for its cities built of brick, roadside drainage system, and multistoried houses. The baths and toilets system the cities had is acknowledged as one of the most advanced in the ancient world. The grid layout planning of the cities with roads at exact right angles is a modern system that was implemented in the cities of this particular civilization. The urban agglomeration and production scale of this particular civilization was unsurpassed at the time and for many future centuries. The mature phase of this civilization is known as the Harappan Civilization, as the first of its cities to be unearthed was located at Harappa, excavated in the 1920s in what was at the time the Punjab province of British India (now in Pakistan). 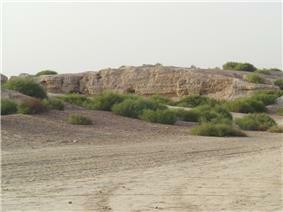 Excavation of Harappan sites have been ongoing since 1920, with important breakthroughs occurring as recently as 1999. To date, over 1,052 cities and settlements have been found, mainly in the general region of the Ghaggar-Hakra river and its tributaries. Among the settlements were the major urban centres of Harappa, Lothal, Mohenjo-daro (UNESCO World Heritage Site), Dholavira, Kalibanga, and Rakhigarhi. 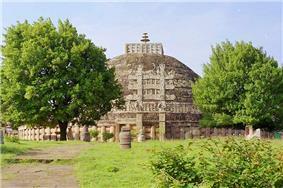 The Great Stupa at Sanchi (4th–1st century BC). The dome shaped stupa was used in India as a commemorative monument associated with storing sacred relics. The Buddhist stupa, a dome shaped monument, was used in India as a commemorative monument associated with storing sacred relics. The stupa architecture was adopted in Southeast and East Asia, where it became prominent as a Buddhist monument used for enshrining sacred relics. Fortified cities with stūpas, viharas, and temples were constructed during the Maurya empire (c. 321–185 BC). Wooden architecture was popular and rock cut architecture became solidified. Guard rails—consisting of posts, crossbars, and a coping—became a feature of safety surrounding a stupa. Temples—build on elliptical, circular, quadrilateral, or apsidal plans—were constructed using brick and timber. The Indian gateway arches, the torana, reached East Asia with the spread of Buddhism. Some scholars hold that torii derives from the torana gates at the Buddhist historic site of Sanchi (3rd century BC – 11th century AD). Rock-cut stepwells in India date from 200–400 AD. 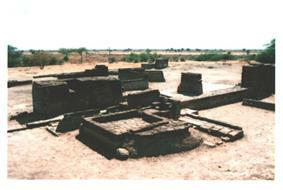 Subsequently, the construction of wells at Dhank (550–625 AD) and stepped ponds at Bhinmal (850–950 AD) took place. 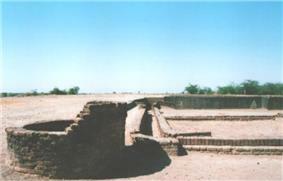 The city of Mohenjo-daro has wells which may be the predecessors of the step well. As many as 700 wells, constructed by 3rd millennium BC, have been discovered in just one section of the city, leading scholars to believe that 'cylindrical brick lined wells' were invented by the people of the Indus Valley Civilization. Cave temples became prominent throughout western India, incorporating various unique features to give rise to cave architecture in places such as Ajanta and Ellora. Walled and moated cities with large gates and multi-storied buildings which consistently used arched windows and doors are important features of the architecture during this period. The Indian emperor Ashoka (rule: 273—232 BC) established a chain of hospitals throughout the Mauryan empire by 230 BCE. One of the edicts of Ashoka (272—231 BC) reads: "Everywhere King Piyadasi (Ashoka) erected two kinds of hospitals, hospitals for people and hospitals for animals. Where there were no healing herbs for people and animals, he ordered that they be bought and planted." Buddhist architecture blended with Roman architecture and Hellenestic architecture to give rise to unique blends—such as the Greco-Buddhist school. Indian art and culture has absorbed extraneous impacts by varying degrees, and is much richer for this exposure. This cross fertilization between different art streams converging on the subcontinent produced new forms that, while retaining the essence of the past, succeeded in the integrating selected elements of the new influences. A long tradition of art and culture was already established well before the beginning of 20th century in India. Indian painting can be broadly divided into two categories—MURALS and MINIATURE. Konark Sun Temple, one of the most well renowned temples in India and is a World Heritage Site. North Indian temples showed increased elevation of the wall and elaborate spire by the 10th century. 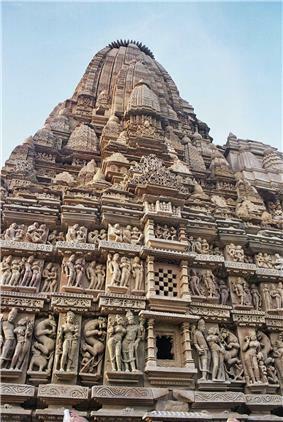 Richly decorated temples—including the complex at Khajuraho—were constructed in Central India. Indian traders brought Indian architecture to South east Asia through various trade routes. Grandeur of construction, beautiful sculptures, delicate carvings, high domes, gopuras and extensive courtyards were the features of temple architecture in India. Examples include the Lingaraj Temple at Bhubaneshwar in Odisha, Sun Temple at Konark in Odisha, Brihadishwar Temple at Thanjavur in Tamil Nadu. Vijayanagara Architecture of the period (1336 – 1565 AD) was a notable building style evolved by the Vijayanagar empire that ruled most of South India from their capital at Vijayanagara on the banks of the Tungabhadra River in present-day Karnataka. The architecture of the temples built during the reign of the Vijayanagara empire had elements of political authority. This resulted in the creation of a distinctive imperial style of architecture which featured prominently not only in temples but also in administrative structures across the deccan. The Vijayanagara style is a combination of the Chalukya, Hoysala, Pandya and Chola styles which evolved earlier in the centuries when these empires ruled and is characterised by a return to the simplistic and serene art of the past. Hoysala architecture is the distinctive building style developed under the rule of the Hoysala Empire in the region historically known as Karnata, today's Karnataka, India, between the 11th and the 14th centuries. Large and small temples built during this era remain as examples of the Hoysala architectural style, including the Chennakesava Temple at Belur, the Hoysaleswara Temple at Halebidu, and the Kesava Temple at Somanathapura. 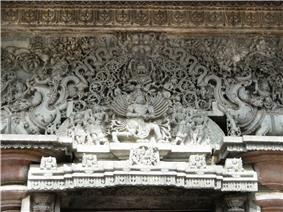 Other examples of fine Hoysala craftmanship are the temples at Belavadi, Amrithapura, and Nuggehalli. Study of the Hoysala architectural style has revealed a negligible Indo-Aryan influence while the impact of Southern Indian style is more distinct. A feature of Hoysala temple architecture is its attention to detail and skilled craftmanship. The temples of Belur and Halebidu are proposed UNESCO world heritage sites. About a 100 Hoysala temples survive today. In the August 1604 CE the construction of the Harmandir Sahib—the holiest shrine of the Sikh religion—was completed. 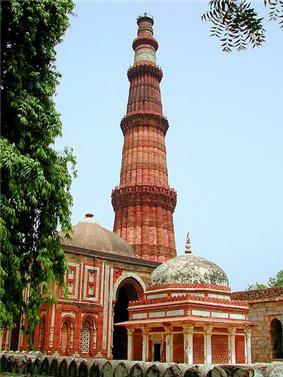 Qutub Minar a prominent example of Islamic architecture in India. Mughal tombs of sandstone and marble show Persian influence. The Red Fort at Agra (1565–74) and the walled city of Fatehpur Sikri (1569–74) are among the architectural achievements of this time—as is the Taj Mahal, built as a tomb for Queen Mumtaz Mahal by Shah Jahan (1628–58). Employing the double dome, the recessed archway, white marble and parks while stressing on symmetry and detail was visible during the reign of Shah Jahan. Quranic verses were described on the walls of the buildings. However, the depiction of any living being—an essential part of the pre-Islamic tradition of India—was forbidden under Islam. The Architecture during the Mughal Period has shown a very good blend of Indian style with the Iranian style. Some scholars hold that cultural contact with Europe under Manuel I of Portugal (reign: 25 October 1495—13 December 1521) resulted in exchange of architectural influences. Little literary evidence exists to confirm the Indian influence but some scholars have nonetheless suggested a possible relation based on proximity of architectural styles. Under colonial rule, architecture became an emblem of power, designed to endorse the patron. Numerous outsiders invaded India and created architectural styles reflective of their ancestral and adopted homes. The European colonizers created architecture that symbolized their mission of conquest, dedicated to the state or religion. The British arrival in 1615 overthrew the Mughal empire. Britain reigned India for over three hundred years and their legacy still remains through building and infrastructure that populate their former colonies. The major cities colonized during this period were Madras, Calcutta, Bombay, Delhi, Agra, Bankipore, Karachi, Nagpur, Bhopal and Hyderabad. St Andrews Kirk, Madras is renowned for its colonial beauty. The building is circular in form and is sided by two rectangular sections one is the entrance porch. The entrance is lined with twelve colonnades and two British lions and motto of East India Company engraved on them. The interior holds sixteen columns and the dome is painted blue with decorated with gold stars. The staple of Madras was Fort St. George, a walled squared building adjacent to the beach. Surrounding the fort was White Town settlement of British and Indian area Black Town later to be called Georgetown. Black Town described in 1855 as "the minor streets, occupied by the natives are numerous, irregular and of various dimensions. Many of them are extremely narrow and ill-ventilated ... a hallow square, the rooms opening into a courtyard in the centre." Garden houses were originally used as weekend houses for recreational use by the upper class British. Nonetheless, the garden house became ideal a full-time dwelling, deserting the fort in the 19th Century. Calcutta – Madras and Calcutta were similar bordered by water and division of Indian in the north and British in the south. An Englishwoman noted in 1750 "the banks of the river are as one may say absolutely studded with elegant mansions called here as at Madras, garden houses." Esplanade-row is fronts the fort with lined palaces. Indian villages in these areas consisted of clay and straw houses, later transformed into a metropolis of brick and stone. The Victoria Memorial in Calcutta, is the most effective symbolism of British Empire, built as a monument in tribute to Queen Victoria’s reign. The plan of the building consists of one large central part covered with a larger dome. Colonnades separate the two chambers. Each corner holds a smaller dome and is floored with marble plinth. The memorial stands on 26 hectares of garden surrounded by reflective pools. The French colonized a fishing village (Pondicherry) in Tamil Nadu and transformed it into a flourishing port-town. The town was built on the French grid pattern and features neat sectors and perpendicular streets and divided into two sectors, French Quarter (Ville Blanche) and the Indian quarter (Ville Noire). French styled villas were styled with long compounds and stately walls, lined houses with verandas, large French doors and grills. Infrastructure such as banks, police station and Pondicherry International Port still hold the French presence. To preserve Pondicherry an organization named INTACH was formed. Authorization is needed from INTACH, to annihilate any original French Architecture. French expanded their empire by colonizing coastal towns, Yanam in Andhra Pradesh, Karaikal in Tamil Nadu and Mahe in Kerala with a French atmosphere of quiet towns around beaches. French spelling on signage and traffic signs still remains. The Dutch entered India with the only interests of Trade in the early 17th Century. During their 200 years in India, they colonized Surat, Bharuch, Venrula, Ahmedabad, Malabar Coast, Kochi and Sadras. Surat – a Dutch factory in 1630’s Bharuch: Trading Post of the Dutch East India Company had a Dutch cemetery. Venrula: a warehouse was built for 3000 Guilders by Leendart Janszoons and a castle for the protection of the Dutch. Ahmedabad: The Dutch cemetery lies on the bank of Kankaria lake. It holds a mix of Indian and European styled graves, with domed tombs, pyramids, walled and plain grave stones. Malabar Coast Kochi: The Dutch Palace (Mattancherry Palace) – The palace was originally built by the Portuguese, it fell into the hands of the Dutch when the Portuguese lost control of Kochi. Dutch cemetery – The cemetery runs parallel to the beach and is the oldest European cemetery in India. It holds 104 tombs that visually narrate the Dutch influence in Architecture during the era. The cemetery is guarded by heavy walls and the entrance pillar still carries the original calligraphic inscription “1724” David Hall – which was the residence of the famous Dutch Commander and Governor of Kochi, Adriaan van Reed lot Drakestein was built in 1695. The hall has been restored as a cultural centre and art café for young, visual and performing artists. Bastion bungalow – This Dutch styled building near the Fort Kochi beach was built to protect the harbor. Thakur House – the Dutch built this bungalow overlooking the sea as a club. Sadras – 17 km (11 mi) from the rock cut temples of Mamallapuram is another Dutch settlement. Pullicat – Pullicat lake 55 km north of Madras is a million years old and the second largest lagoon in India. It was the most important trading post of the Dutch. They built two cemeteries. One was ruined due to negligence and at the entrance is flanked by stone pillars, having 76 tombs. Images of skeletons are carved onto the gravestones, symbolizing life and death. The Portuguese arrived as merchants in the 1498 and were more driven by a Catholic missionary zeal than gaining powers in India. The Portuguese gained a foothold in Goa and ruled for 400 years. Portuguese dominance in Goa still remains evident. Colonizers' missionary spirit built many magnificent cathedrals, churches, basilicas and seminaries. The Basilica of Bom Jesus (Good Jesus), Old Goa, former capital during the Portuguese rule. The three storied Renaissance styled church was built of plaster and laterite in 1605, and holds the mortal remains of St. Francis Xavier. The interior is built in a Mosaic-Corinthian style and adorned with wood and gold leaf. The walls embrace old painting of saints as the floor is laid with pure white marble. The Portuguese – Catholic houses faced the street with unique large ornamental windows opening onto verendahs. Bold colours were painted on houses constructing distinct identity, allowing the sailors to recognize their houses from sea. The covered porches and verandas were designed for socializing contrary to the Hindu styled housing. Front doors were lined with columns, and railings were popular in embellishment. The interior of Goan-Portuguese houses consisted of elaborate patterns created with tiles imported from Europe and a false ceiling installed of wood. The walls are painted with bright colours contrasting to the earthy coloured furniture. The walls were made out of mud or laterite stone and coloured with vegetable and natural dyes. Gateposts and compound walls were craved with great detail. Indian Architecture continued to flourish as they took influence from the colonies. Indian Architecture further shaped as they combined the colonial influences with traditional Architecture. The Se Cathedral—located in Old Goa—is a cathedral dedicated to Catherine of Alexandria. 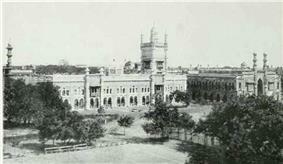 The North Block in New Delhi houses key government offices, built along with Lutyens' Delhi. Chandigarh Secretariat designed by Le Corbusier. The Taj Mahal in Agra, arguably the greatest example of Islamic architecture in India. ^ a b c d See Raj Jadhav, pp. 7–13 in Modern Traditions: Contemporary Architecture in India. ^ a b c d e "(Brief) History of European – Asian trade". European Exploration. Retrieved 14 October 2011. ^ Dutta, Arindam (29 March 2010). "Representing Calcutta: Modernity, Nationalism and the Colonial Uncanny". Journal of Architectural Education 63 (2): 167–169. ^ Nilsson 1968, pp. 94–97. ^ Wild, Anthony (2000). The East India Company: Trade and Conquest from 1600. New York: The Lyons Press. pp. 32, 45, 74, 88, 89. ^ Thapar 2004, p. 124. ^ Mankekar 2004, p. 99. ^ Mankekar 2004, p. 17. Evenson, Norma (1989). The Indian Metropolis. New Haven and London: Yale University press. Mankekar, Kamla (2004). Temples of Goa. India: Ministry of Information and Broadcasting, Govt. of Ind. Nilsson, Sten (1968). European Architecture in India 1750 – 1850. London: Faber and Faber. Tadgell, Christopher (1990). The history of architecture in India : from the dawn of civilization to the end of the Raj. London: Architecture Design and Technology Press. Thapar, Bindia (2004). Introduction to Indian Architecture. Singapore: Periplus Editions.